A low cost aluminium heat sink for mounting an SSR (Solid State Relay). 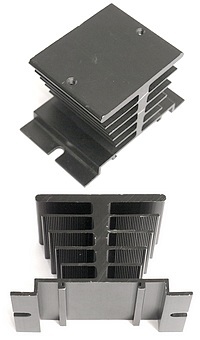 The heat sink will help to dissipate heat from the SSR, keeping it cooler and prolonging its life-span. It can be panel mounted or DIN rail mounted, by sliding it on from an open end of the DIN rail. See the data sheet for dimensions.